Pannekoek, Frits and Erin James-abra. "Fort McMurray". The Canadian Encyclopedia, 11 March 2019, Historica Canada. https://www.thecanadianencyclopedia.ca/en/article/fort-mcmurray. Accessed 19 April 2019. Fort McMurray (Alberta), zone de service urbaine non constituée en société, population 75 615 (2018), 82 724 (2015). Fort McMurray est la plus grande communauté de la municipalité régionale de Wood Buffalo (MRWB). En principe reconnue comme la zone de service urbaine de la municipalité, elle est familièrement appelée « Fort Mac ». La communauté est située au confluent des rivières Athabasca et Clearwater, dans le nord-est de l’Alberta, près du centre du vaste gisement de sables bitumineux d’Athabasca. 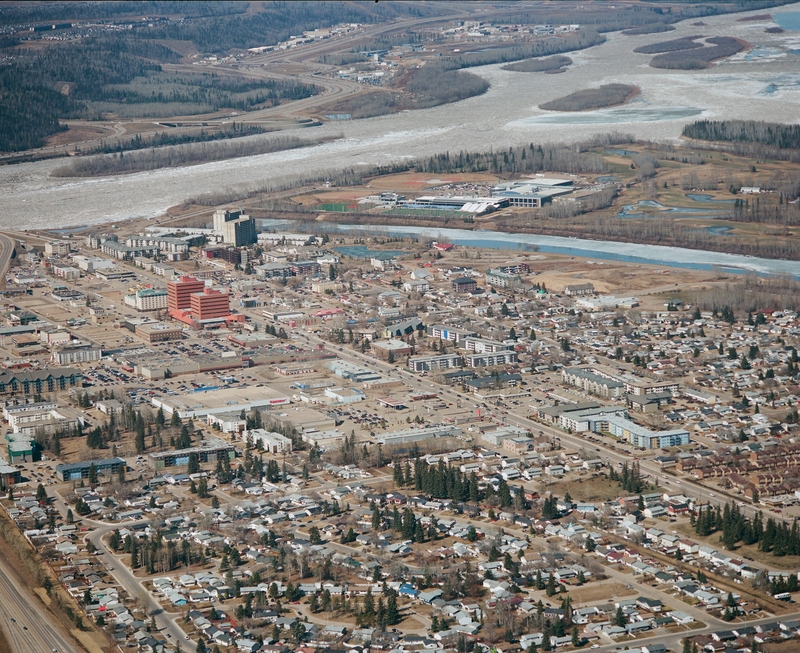 Légalement incorporé à titre de ville en 1980, Fort McMurray fusionne en 1995 avec une grande partie de la région environnante, collectivement connue sous le nom du district d’amélioration n° 143, afin de créer la MRWB. Avec ses 63 783 km², elle constitue la municipalité avec la plus grande superficie en Amérique du Nord représentant près de 10 % de la superficie totale de la province. En mai 2016, Fort McMurray a connu l’un des pires feux de forêt de l’histoire du Canada. Plus de 80 000 habitants ont été évacués et environ 2 400 structures, soit environ 10 % de la ville, ont été détruites. Cree and Denesuline traditional territory. Prior to the arrival of Europeans, Indigenous people, namely Cree and Denesuline (also known as Chipewyan), occupied large swaths of land throughout central and sub-Arctic Canada, including the Lake Athabasca region and future site of Fort McMurray. The Cree were semi-nomadic, congregating at lakes in the summertime to fish, hunt game, gather berries and reconnect with other bands. Come autumn, groups would disperse for winter territory via canoe, snowshoe and toboggan. Moose	and elk were hunted by bow and arrow, while woodland caribou were snared or speared. The migration patterns of the Denesuline mirrored those of the barren-ground caribou, an animal of immense cultural importance. In 1789, the first North West Company fur trading post was established at Fort Chipewyan, north of present-day Fort McMurray on the western tip of Lake Athabasca. By the end of 19th century, as the fur trade continued to expand west, band membership became associated with specific trading posts. Communal hunting gave way to individual hunting, and the life of both the Cree and Denesuline became less nomadic. Around this time Métis also moved into the region as workers for the North West and Hudson’s Bay companies. By 1891, potential oil and mineral reserves had been identified throughout the Lake Athabasca area. The federal government began plans for a treaty with Indigenous people in the region, motivated at least in part by a desire to own the land before Indigenous people discovered its monetary value. In the summer of 1899, representatives of the Cree, Denesuline and Dane-zaa	met at Fort McMurray and other locations to sign Treaty 8. In exchange for the land, the tribes were given reserves, annual cash payments and certain hunting and fishing rights. Métis were given the option of joining the treaty process, but few chose to. Instead, they signed certificates called “scrips” that eliminated their title to the land in exchange for land or one-time cash payments. As with other Indigenous groups across the country, the arrival of Europeans and the treaty negotiations that followed had profound, negative long-term impacts on the Cree, Denesuline and Métis (see also Epidemics, Residential Schools, Numbered Treaties). Today, the Fort Chipewyan – Fort McMurray area remains at the heart of Treaty 8. There are five First Nations within the Rural Municipality of Wood Buffalo: Mikisew Cree, Athabasca Chipewyan, Fort McKay, Fort McMurray No. 469 and the Chipewyan Prairie Dene. Wood Buffalo Métis are represented by six locals. In his exploration of Western Canada, fur trader Peter Pond stopped at the confluence of the Athabasca	and Clearwater rivers — the future site of Fort McMurray — in 1778. From that point forward there is evidence that Europeans (primarily the North West Company) had a series of minor trading posts at the site beginning around 1786. However, it wasn’t until 1870 that H.J. Moberly of the Hudson’s Bay Company established a major post at Fort McMurray, naming it after HBC factor William McMurray. More than a fur-trading post, the fort was meant as a terminal for a proposed steamboat route, moving furs toward Edmonton	along the Athabasca River. In 1883, the S.S. Grahame, the first vessel to travel the route, made her maiden voyage. 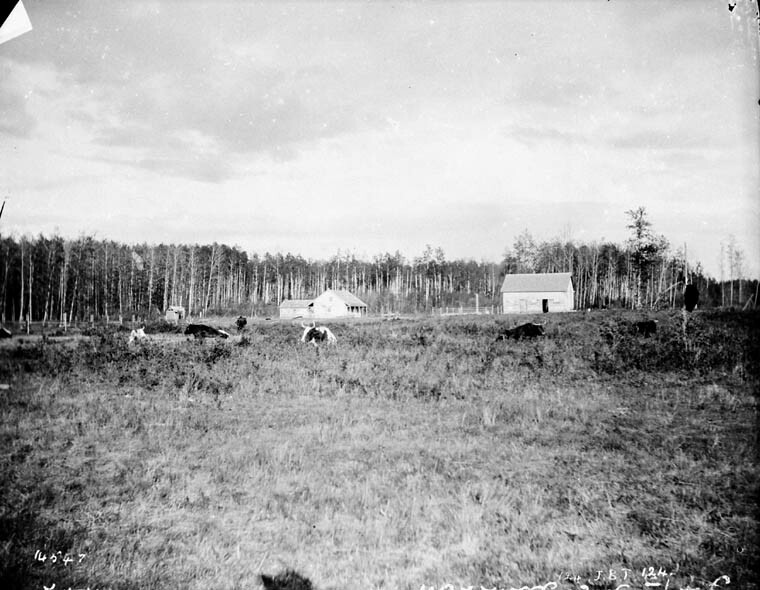 Fort McMurray, Alberta, c. 1893. 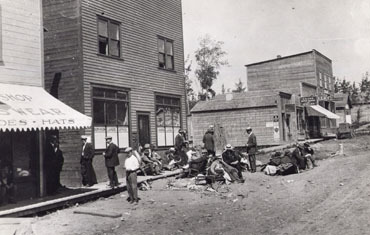 Fort McMurray acquired its reputation as a boom and bust town early in its history. While potential oil reserves had been identified as early as 1891, the first oil sands project didn’t begin until 1964. Expectations prompted by periodic mineral surveys led to early, periodic economic booms that invariably collapsed. In 1913, for example, an investigation conducted by the federal government’s Mines Branch led to land sales of $1,500 per lot. However, when it was announced the oil sands still weren’t economically viable, the value of these lots plummeted to $8 each. 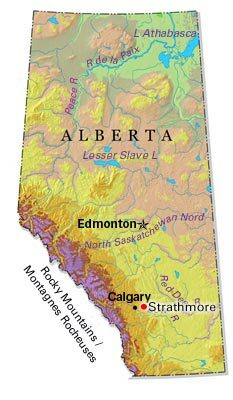 As railways began to be built across the province in the late 1800s (the Canadian Pacific Railway reached Medicine Hat, Calgary and Banff in 1882–83) the Alberta government looked to build a railway from Edmonton	to Fort McMurray in order to further stimulate resource development. The Alberta and Great Waterways Railway was incorporated in 1909, and after a false start and political mismanagement, broke ground in earnest in 1914. By 1921 the track had reached Deep Creek at the Clearwater River (now the community of Draper). In 1928, the track was further extended to the Hangingstone River and what would become Waterways, now a Fort McMurray neighbourhood (the railway was never extended to Fort McMurray proper). In 1929, the Alberta and Great Waterways Railway became a part of the Northern Alberta Railways. 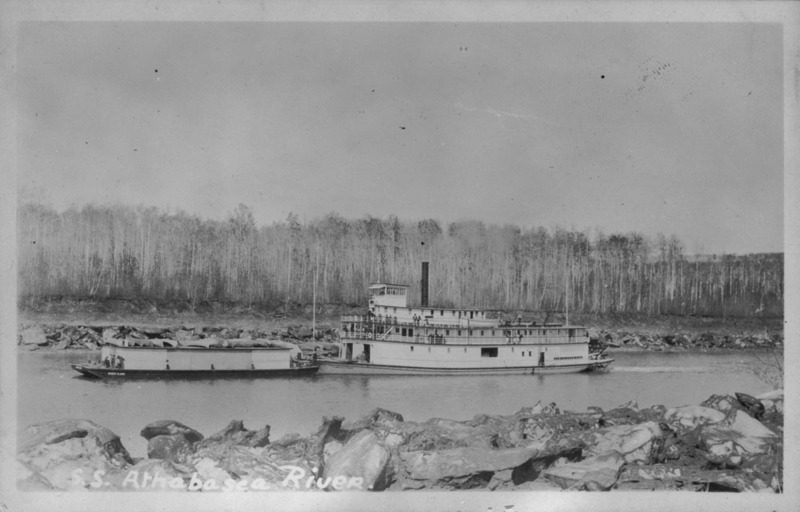 Steamboat S.S. Athabasca River passing Fort McMurray, c. 1927. The arrival of the railway facilitated a fishing industry in and around Fort McMurray. In 1926, McInnes Fish Company began a commercial fishing business on Lake Athabasca. They built an icehouse at Waterways to pack the fish and ship it to the US via the Northern Alberta Railway, and in 1928 the National Fish Company did the same. While drilling exploratory wells in an effort to find oil, between 1907 and 1912 the Northern Alberta Exploration Company discovered salt at the mouth of the Horse River. From 1925–26 the company operated a salt mine at this location — the first in the region. A second salt mine was operated by Industrial Minerals between 1937 and 1950. When large, accessible salt beds were discovered east of Edmonton at Elk Point, operations were moved there. Fort McMurray, Alberta, c. 1927. During the Second World War, Fort McMurray was an important base for the Canol Pipeline project. Steel and equipment for the line were shipped along the railway to Waterways where they were transferred to boats, continuing their journey north to Norman Wells, Northwest Territories. Waterways and Fort McMurray incorporated as the village of McMurray in 1947. 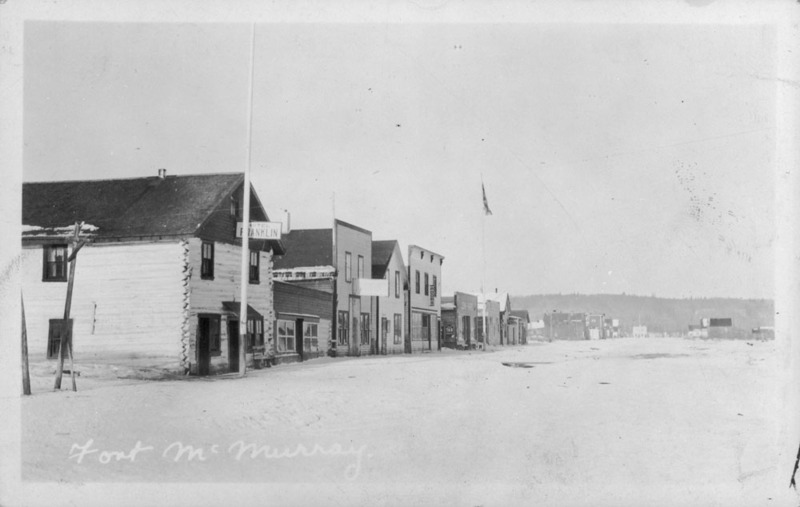 A year later McMurray gained town status, and in 1962 changed its name to Fort McMurray. Modern Fort McMurray was born in 1964 when Great Canadian Oil Sands (now Suncor Energy Inc.) was given permission to start construction on a plant to separate the bitumen from the oil sands. The town grew from 2,614 in 1966, to 10,000 by the mid-1970s. Ten years later, with a second project led by Syncrude Canada, the population grew to nearly 37,000. In the late 1990s, Fort McMurray saw another jump in population to 47,705, brought on by increased demand for oil resulting from high world oil prices, a new Alberta government royalty regime and the advent of new technologies, i.e., steam-assisted gravity drainage (SAGD). Virtually all key global and national oil companies had a stake in the oil sands. Between 2011 and 2015 Fort McMurray’s population increased again, from 61,374 to 82,724 — nearly a 35 per cent increase. The growth of the last decade put incredible pressures on transportation, housing, social services, and municipal services such as sewage and water. Fort McMurray lacked the land required to keep pace with residential developments, a problem the Alberta government helped to remedy beginning in 2012 by transferring crown land to the Regional Municipality of Wood Buffalo (RMWB). Fort McMurray is made up of eight neighbourhoods: Abasand Heights, Beacon Hill, Gregoire, the Lower Townsite, Parsons Creek, Thickwood Heights, Timberlea and Waterways. In addition to Fort McMurray, the RMWB includes nine smaller communities: Anzac, Conklin, Draper, Fort Chipewyan, Fort Fitzgerald, Fort McKay, Gregoire Lake Estates, Janvier, Saprae Creek Estates, as well as five First Nations communities and six Métis Locals. 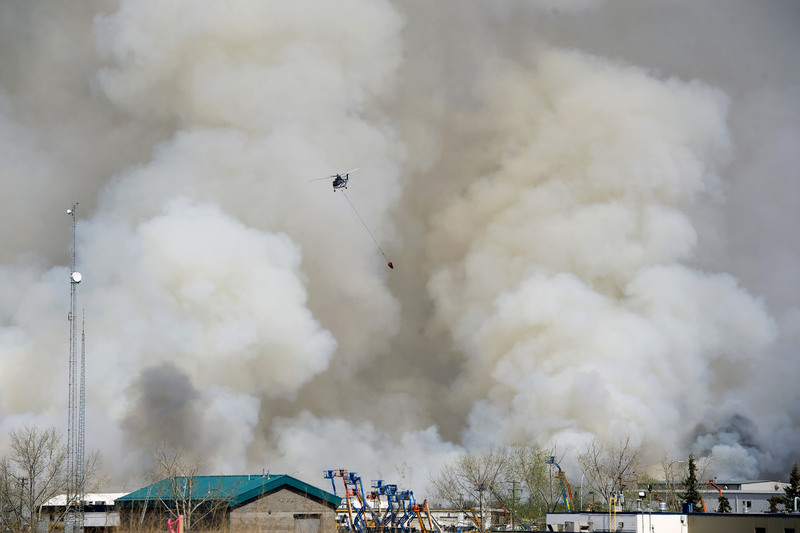 The wildfire encroaches on Fort McMurray, 4 May 2016. 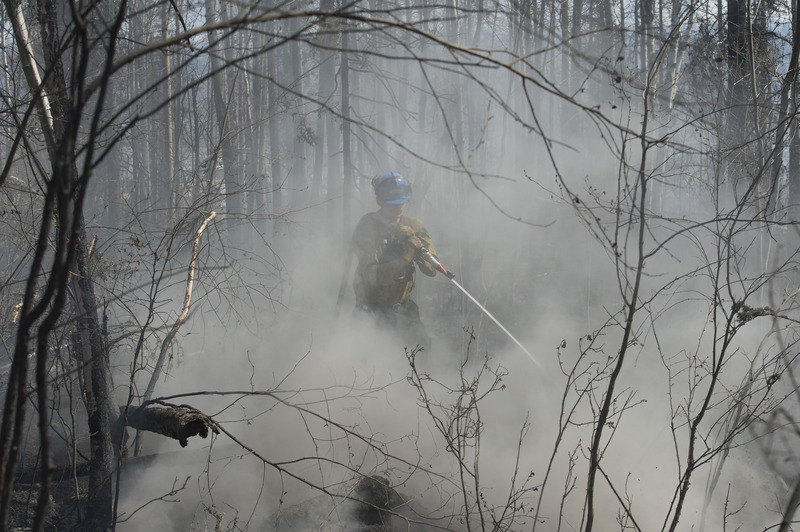 A member of Wildfire Management Alberta's Wild Mountain Unit hoses down hotspots in the Parsons Creek area of Fort McMurray, 6 May 2016. 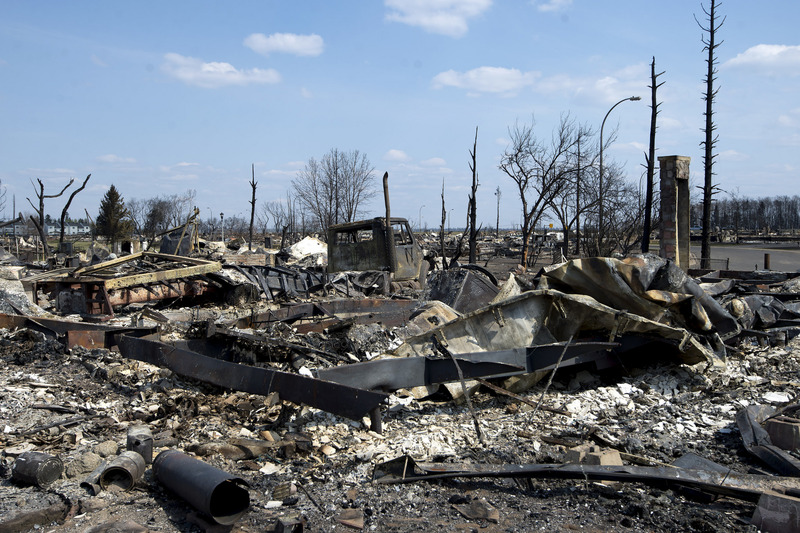 Damage caused by a wildfire that swept through several neighbourhoods in Fort McMurray on 3 May 2016. Downtown Fort McMurray. Photo in April 2016. Fort McMurray has long debated the development of its downtown core. As an urban centre made up of multiple subdivisions, finding a focal point has proved challenging. Policy-makers are currently guided by a plan to redevelop the city centre, defined as the area extending south from MacDonald Island, and including the Lower Townsite and Waterways neighbourhoods. The plan emphasizes public transit, walking and cycling, as well as high density development including both housing and commercial areas. MacDonald Island Park has already developed into a central gathering place for Fort McMurray residents. It is home to Canada’s largest recreation complex, including the Suncor Community Leisure Centre, which in turn houses the Syncrude Aquatic Centre, four skating rinks, an eight-sheet curling rink, indoor climbing wall, library and other recreational facilities. The park is also home to an 18-hole golf course and, as of 2015, Shell Place. Its facilities include a baseball stadium, concert venue, badminton centre and conference space. Another complex, this one tied to the city’s Muslim community, began construction in the spring of 2015. The new space replaces Fort McMurray’s original mosque, built in 1990. For some time, Markaz ul-Islam — the name of both the old and new mosque — was unable to accommodate the city’s growing Muslim community. Friday prayers had to be held in shifts or in the gym at Holy Trinity High School. The second version of Markaz ul-Islam includes two prayer halls, a K-12 school, recreation centre and swimming pool. Entre 2015 et 2018, la population de Fort McMurray diminue de 82 724 à 75 615 personnes, soit une baisse de 8,6 %. Cette diminution s’inscrit dans le contexte d’une baisse de la population de la région entière, ce qui ne s’était pas produit dans la MRWB depuis deux décennies. Les fonctionnaires attribuent ce changement dans la population aux feux de forêt de 2016. La population de Fort McMurray comporte à la fois une population permanente et une « population clandestine », c’est-à-dire un groupe de travailleurs non permanents employés principalement par les compagnies des sables bitumineux. Elles vivent à la fois dans des logements résidentiels ainsi que dans les hôtels, les motels et les terrains de camping. Selon un recensement de 2018 effectué par le MRWB, , la population clandestine représente 4,7 % des résidents de Fort McMurray (soit 3 559 personnes). Le nombre d’hommes à Fort McMurray par rapport au nombre de femmes est supérieur à la moyenne nationale, en grande partie attribuable à la dépendance de la ville à l’industrie des sables bitumineux dominée par les hommes. En 2015, 55,4 % de la population de Fort McMurray était composée d’hommes et 44,6 % de femmes. Par comparaison, au cours de la même année, 49,6 % de la population totale du Canada était des hommes et 50,4 % des femmes. Fort McMurray abrite également un grand nombre de résidents originaires d’autres provinces, dont beaucoup sont attirés par la ville pour travailler dans l’industrie des sables bitumineux. En particulier, le Canada atlantique, qui a toujours connu des taux de chômage élevés, a tissé des liens étroits avec Fort McMurray. En 2012, 16,5 % des résidents de Fort McMurray ont déclaré Terre-Neuve et Labrador comme leur province d’origine. Bien que la majorité des résidents de Fort McMurray s’identifient comme étant de race blanche, la ville est connue pour son multiculturalisme. Les minorités visibles représentent 37,1 % des résidents de la ville, selon le recensement de 2016 de Statistique Canada. À l’intérieur de ce groupe, les communautés les plus importantes sont les Philippins, les Asiatiques du Sud, les Noirs et les Arabes. Fort McMurray is the centre of Canada’s oil production and is often characterized as a “boomtown,” meaning its growth and prosperity is tied the rise and fall of oil prices. While Statistics Canada does not collect labour force data for Fort McMurray specifically, data for Wood Buffalo as a whole is indicative of the region’s reliance on the oil sands. In 2011, nearly 30 per cent of Wood Buffalo’s workforce was employed in oil and gas extraction or related activities, according to the National Household Survey. When considering those who are indirectly employed by oil and gas (for example, the construction workers needed to build housing for workers who flock to the area) the region’s connection to the industry is further magnified. Roughly speaking, following the 2008 recession, oil prices hovered between $80 and $100 per barrel (USD). In the summer of 2014 they began to slide, reaching a low of about $30 per barrel by February 2016. Between December 2014 and May 2016, employment in the oil and gas industry across Canada decreased by an estimated 43,000 jobs, layoffs which disproportionally affected Alberta. The province’s unemployment rate rose from 4.7 per cent in 2014, to 6 per cent in 2015. In Wood Buffalo-Cold Lake — an enumeration area designated by Statistics Canada and home to Fort McMurray and other communities around the oil sands — unemployment rose from 4.7 per cent to 7.9 per cent. 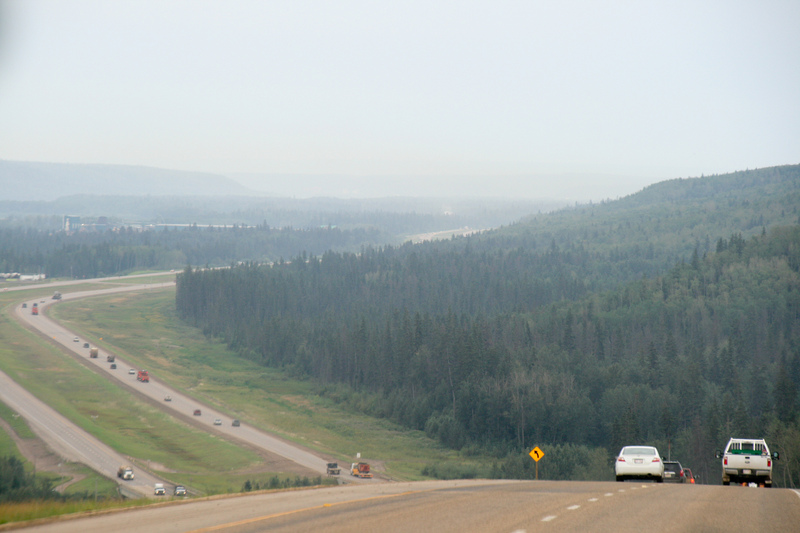 Highway 63 near Fort McMurray, Alberta. Photo taken on 15 August 2013. Highway 63 is the main north-south route connecting Fort McMurray and the oil sands to the rest of the province. Spanning 443 km, the highway is notoriously dangerous, garnering such nicknames as Suicide 63, Highway of Death and Hell’s Highway. Between 2008 and 2012 there were 2,457 accidents along the thoroughfare. The highway is dangerous for a number of reasons. As the main artery to and from the oil sands, trucks are often carrying large industrial loads, often so big they spill over into adjacent lanes of traffic. Similarly, shift workers driving to and from the oil sands may find it difficult to stay awake along the long stretches of remote territory. Moreover, until recently much of Highway 63 was a single lane highway, with passing lanes only cropping up periodically. In an effort to remedy this problem, in May 2016 the Alberta government completed its twinning project, opening four lanes of traffic along 240 km of Highway 63, between Grassland and Fort McMurray. Fort McMurray is also served by the Fort McMurray International Airport (YMM) and a provincial bus system including companies such as Red Arrow and Greyhound. Since 1980, Fort McMurray has also operated a municipal bus system. Fort McMurray is served by Rogers and Harvard Broadcasting, and rebroadcasts from CBC and Alberta-based CKUA. Harvard Broadcasting is owned by The Hill Companies, a Regina-based corporation. There are two major newspapers, each with an online presence: Fort McMurray Today, owned by Post Media, and Fort McMurray’s Connect Weekly. The Regional Municipality of Wood Buffalo’s municipal government consists of a mayor and 10 councillors elected from four wards. Ward 1, representing the urban service area, has six councillors. The three rural wards have one councillor each except for Ward 2, representing Fort Chipewyan and Fort McKay, which has two. The Council’s work has been largely consumed with the problems of growth — in particular housing, social services and transportation. Given the contribution of Fort McMurray to the national and provincial economy, it has not been unusual for Fort McMurray to have cabinet members in the Alberta legislative assembly or in the federal parliament. In addition to MacDonald Island Park, Fort McMurray is also home to Keyano College, the Oil Sands Discovery Centre and Heritage Park. In the winter, the Oil Barons play as part of the Alberta Junior Hockey League — a provincial Junior A league. During the summer, the Fort McMurray Giants compete in the Western Major Baseball League. MacDonald Island ParkThe website for MacDonald Island Park includes information about what’s going on at Canada’s largest recreation complex. Regional Municipality of Wood BuffaloThe website for the Regional Municipality of Wood Buffalo offers information for residents and visitors. Under One RoofAn article by Globe and Mail reporter Colin Freeze about multiculturalism in Fort McMurray and plans to build a new mosque.